Nearly every football team begins summer conditioning workouts for high school football players long before the season ever begins. Ask any successful coach and he will tell you that games are not won or lost on the field, but in the preparation before the players hit the field. For this reason alone, summer conditioning is vital for football players. Strength Training: Building mass is one of the best ways to improve performance on the field. The stronger a player is, the less effort playing will require. This concept works for every player on the team, from the quarterback to the halfback. A quarterback might want to focus on upper body strength, for example, while other players might want to focus on lower body strength. Drills: Participating in drills with the team can increase speed and agility. Because football is a game of speed and strength, use basic drills, such as running drills, by setting up tires or cones. Flexibility: Believe it or not, flexibility can be vital to playing a strong game of football. Being able to quickly twist, turn and dodge can mean the difference between a fumble and a touchdown. Exercises that increase flexibility include a wide variety of stretches or even some gentle Yoga and dance moves. Stamina: In order to last through four quarters and play the best game possible, football players must have stamina. Aerobic conditioning through running the track or swimming can help build stamina. 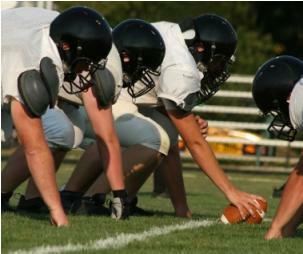 Scrimmage Games: Practice games can help players prepare for real life battle with other football teams as well as conditioning players to play the entire length of a game instead of only in short spurts. While there are numerous drills and exercises that can help with summer conditioning workouts for high school football players, below are a couple of the more effective ones. Please feel free to add your own team's most successful drills below in the comments area. At some point in one or more games, a player will fumble the ball. This drill can prepare your players for that occurrence, so your team has a chance at recovering the fumble. You'll want to place the defense on the field at the opponent's 10 or 20-yard line. Begin a play as though in a game, allowing the defense captain to call out a defense and the quarterback to count. The player who catches the quarterback's throw should intentionally fumble. When this happens, the nearest players on both defense and offense should attempt to recover the ball and run for the end zone (which end zone will depend upon which side they are playing for). Players should give full effort to recover the fumble, including blocks. This exercise is meant to speed up footwork. Using tape if inside and paint if on grass, the numbers one, two and three should be painted in a box with two number ones on the lower side in each corner, the number two in the direct center and two number threes along the upper edge in each corner.The player starts with feet spread apart and on the ones. When the coach blows the whistle, the player should leap into the air and land with both feet on the number two. When the coach blows the whistle again, the player should jump and place both feet on the number threes. The process is then reversed as the player jumps backwards to two and then to one. The goal is to get faster and faster at this drill. Football conditioning shouldn't be something you do only once a year during football camp or just before the season starts. True physical stamina and athletic ability should be an ongoing process. You should continously strive to improve yourself in ways that will make you a better football player. You can achieve this with consistent workouts and by listening to your coaches.